New luxury has made the far-flung Gobi more accessible than ever. 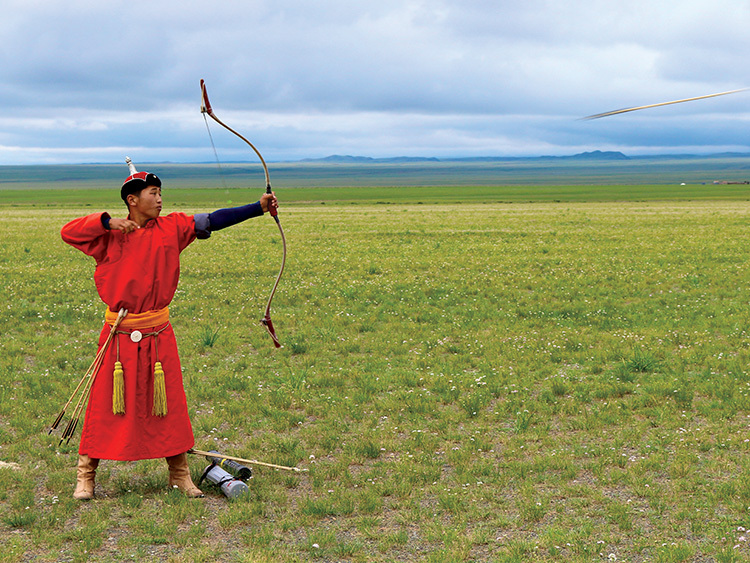 Nomadic culture is alive and well in one of the most enigmatic and faraway countries: Mongolia. After years of communism that isolated much of this landlocked country, the homeland of Genghis Khan is poised to reconquer the world, at least from the tourism perspective, by showcasing its richest asset: thousands of miles of remarkable nothingness once home to great dinosaurs that is today the backyard of a compelling culture of camel-toting wanderers. All travelers to the Mongolian outback must first lay over in Ulan Bator. And fortunately for them, the country’s cultural, financial, and industrial center is also evolving at a steady clip. What was once a dusty nexus of nomadic trails, UB is now a metropolis so fervently embracing globalization that the cityscape looks like a bizarre Sim City animation complete with residential towers swarmed by phalanxes of canvas yurts. The legend of Genghis Khan (known locally as Chinggis Khan) is also apparent throughout the city, from his gigantic portrait etched into the side of a mountain to the proliferation of institutions named in his honor. As the founder of the great Mongol Empire, which at its height of power was the largest contiguous kingdom in history, he is celebrated as the figurehead of national might. Khan’s empire was short-lived, and Mongolia’s more recent history is one of subjugation, easily discerned by the Chinese temples and Soviet relics throughout. A stop on the Mongolian branch of the Trans-Siberian Railroad, UBfeels like an unlikely outpost where two superpowers, China and Russia, suddenly interlock. Where else in the world would you see a Cyrillic sign pointing the way to a Buddhist monastery? The Shangri-La Ulaanbaatar (Shangri-La.com) has solved the accommodation conundrum in the capital by providing the first luxury stay in the nation, equipped with all of the trappings of an upmarket hotel catering to business travelers and the discerning adventurer alike. Rooms climb a modern tower, and employ a sleek international style with views of a heterogenous skyline below. The hotel’s most impressive feature, however, is its culinarily offerings. A foodie destination Mongolia is not, and while the country’s Sino-Russki combustion promises fascinating cultur-al manifestations, the heavy, winter-proof cuisine is woefully lackluster. The Shangri-La’s elevated approach to traditional favorites makes it an oasis in this dining desert. Three separate venues attract both travelers on a stopover and local expats: Hutong explores the flavors of Northern China with classics like Peking duck and steaming clay pot stews; Naadam tries its hand a simmering steaks and top-shelf vodka; and Cafe Park breaks away from regional flavors and provides an assortment of international comfort food served buffet-style. Desert camping has elevated the comfort quotient as well. Nomadic Expeditions (NomadicExpeditions.com) is the undisputed trendsetter, fusing modern amenities to their traditional yurts. Their flagship camp in the Gobi desert, Three Camel Lodge, pipes hot running water into their en-suite showers, and even offers guests an array of l’Occitane beauty products to slough off a day’s worth of dusty exploration. The huddle of yurts operates as central command, from which excursions are executed in a style similar to African safaris — protracted jeep journeys through arid expanses of wilderness to take in the region’s highlights, like fields of dried mud that have perfectly preserved thousands of shards of ancient dinosaur bones, rock drawings, and close encounters with Bactrian camels and their nomadic owners. 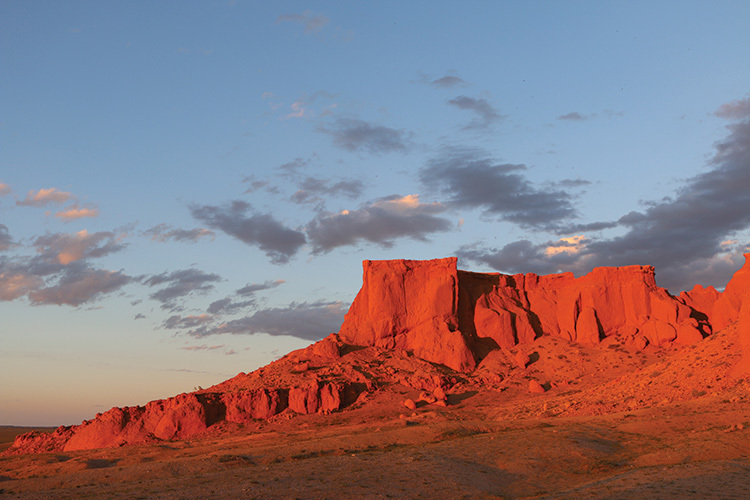 The Gobi experience culminates with a unique dinner at the Flaming Cliffs. Named by Roy Chapman Andrews,the buffs turn a scorching orange — even more brilliant than the canyons of Utah — at sunset. It was here in 1923 that he discovered the world’s first hoard of dinosaur eggs, forever cementing the area’s reputation in the annals of paleontology. Young musicians serenade VIP diners as the beige landscape turns amber, red, and gold. The best time to visit Mongolia is during the Naadam festival season in summer when far-flung nomadic clans come together to fraternize and compete in traditional games. Recognized as an intangible treasure by UNESCO, the gatherings feature three competitive events and provide a crucial window into Mongolia’s nomadic traditions — it’s one of the last places on the planet that preserves this ancient way of life. Children jockey long-haul horse races, muscly wrestlers show off their assets with a tight ceremonial vest and tiny shorts, and archers engage in target practice while adorned in glossy ceremonial robes called deel. Many attendees play shagai, a fortune-telling game using the anklebones of a sheep. Offering a great souvenir to bring home to your friends, shagai further mints Mongolia’s not-in-Kansas currency, which is luring new adventurers.